The Pebble Beach (now expanded) Weekend has become, arguably, the premier vintage automotive event in the U.S. Held each August, it includes not only vintage races at Laguna Seca, but also the Pebble Beach Concours d’Elegance along with a number of other Concours, many auctions and parties, parties, parties. The Pebble Beach celebration recalls what sports car racing in the U.S. was like during the fifties. It was unique and very different from American circle-track or drag racing of the time. It was also different from previous decades or those that came after. First of all, it was an amateur sport. But unlike most amateur sports – except perhaps for something like the Olympics and some college sports – it attracted considerable press attention and often thousands of spectators. Many of us raced the cars we drove every day on the street. And most of us drove it to the track and – hopefully – back again. One of the racing rules then was that competing sports cars had to be licensed for the road and include such items as a passenger seat and spare tire. We raced on temporary circuits like the one at Pebble Beach. This was, after all, road racing. For the most part, our temporary venues were located in or near resorts and sports car racing then was as much a social event as a competition. Today, some of us remember the parties more than the races. Bongo bashes were the cat’s meow. Officials and course workers were all volunteers and events were social for them also. It was like a fraternity or maybe akin to a military unit that saw combat. Owning a sports car then put us in an exclusive society. When we passed each other on the highway, we would wave. Many of us are still friends years later and we still get together now and then to socialize. 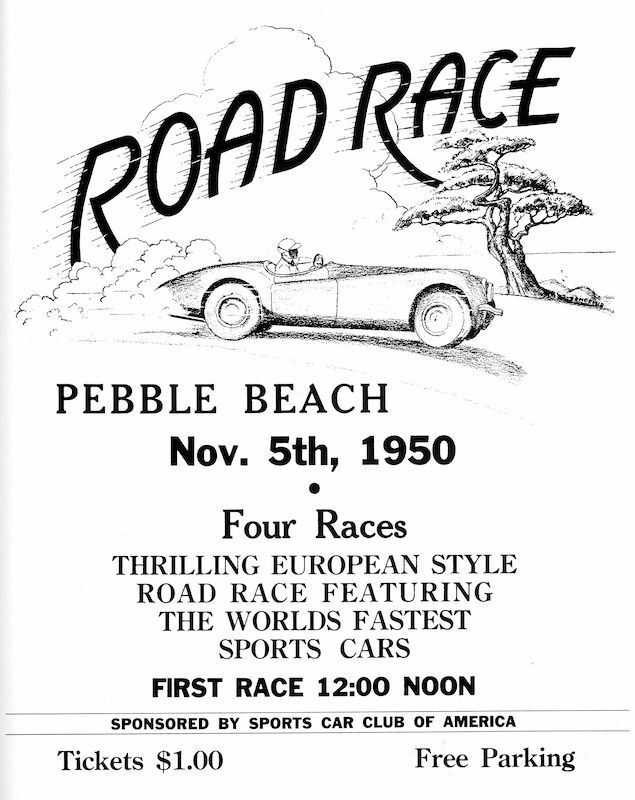 The first Pebble Beach took place on November 5, 1950. The location of the course was on roads within the Del Monte Properties. Much of the Monterey Peninsula is taken up by the Properties, encompassing some 20,000 acres and more than 150 miles of private roads. In addition to hotels, clubs and perhaps more golf courses than people, there are quite a number homes on the Property. It is a gated and privately guarded community. Lots and houses are owned by the residents while all the other land is owned by the Del Monte Properties Company. While the 1950 Pebble Beach was the first race ever organized by the Sports Car Club of America, it wasn’t the first on the West Coast. To put it in context though, perhaps a little history is in order. The first road race after WWII was held in the small town of Watkins Glen in the Finger Lakes Region of New York on October 2, 1948. The first on the West Coast was in Northern California at Buchanan Field in Concord on November 20, 1949. It was organized, not by the SCCA, but by the Northern California MG Club, headed up by Kjell Qvale. The main event was six laps around a three-mile course laid out on the airfield’s runways. Kjell’s brother, Bjarne (Barney), won, in an MG (of course). 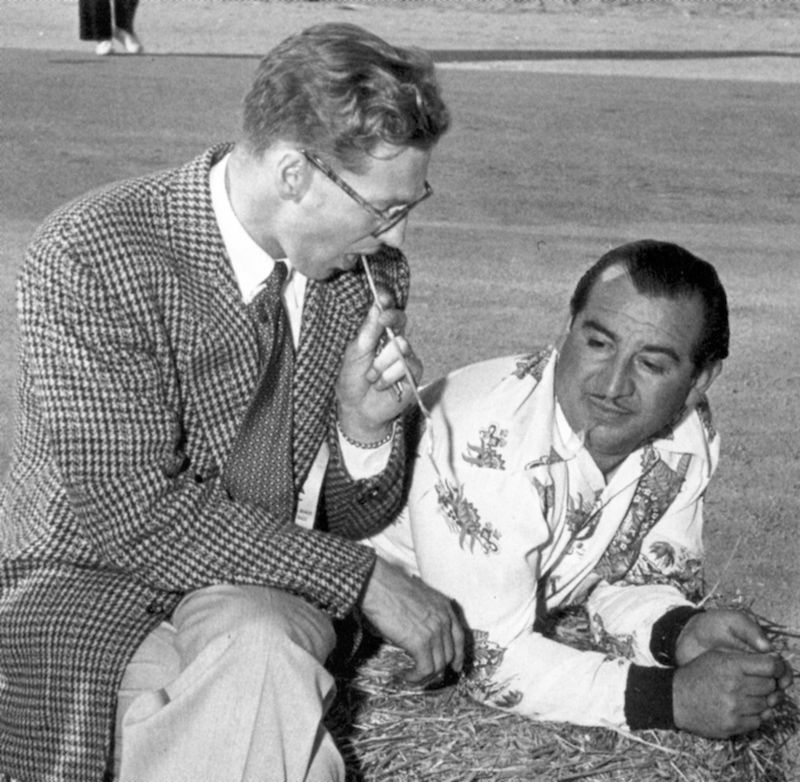 The next in the West was at Palm Springs on April 16, 1950, put on by the California Sports Car Club (not then a Region of the SCCA). Sterling Edwards in his Edwards Special won the main event. In May 1950, the MG Club had another race a Buchanan Field and the Cal Club raced at the Santa Ana Blimp Base on June 25. The Del Monte Properties on the Monterey Peninsula seemed to be to be as an unlikely location for road racing as was Watkins Glen. Wondering how it came about, I contacted my friend, the eminent motorsports historian, Michael Lynch. He told me that one man, Sterling Edwards, was largely responsible. Edwards, a member of the San Francisco Region, was a wealthy heir to a steel-cable manufacturing business. In addition to racing himself, Edwards was interested in race organization. He also constructed a number of cars. The first was the Edwards R-26 Special he made in 1949. It was a ground-up All-American creation with a tubular-steel frame, a light-weight aluminum body and powered by a highly-modified Ford V8-60 engine. It was the car he drove at the two 1950 Southern California races as well as the first Pebble. Sterling continued his car-building efforts with a second special and then he made an attempt at manufacturing a sports car he named the Edwards America. While actually very advanced and attractive for the day, each cost more to make than he could sell them for. So after making five, he gave it up. Sterling was a close friend of John B. (Jack) Morse, then president of the Properties. The company was trying to attract people to stay at the Del Monte Lodge (now the Lodge at Pebble Beach) as well as sell vacant lots. So Edwards convinced his friend, Jack, to provide the venue. It was a natural fit. A race would generate the publicity desired by the company and the SCCA would have a place to stage events. Sterling was named the chairman of the race committee but because he had entered to race, Kjell Qvale assumed the chair. Qvale was significant in the development of the sport in Northern California. He was instrumental in organizing the MG Car Club race at Concord in 1949, plus the first Pebble and later, the Golden Gate Park events in San Francisco. A native of Norway, he was born in 1919. In 1929, he immigrated to the U.S., lived through the Depression and became a Navy pilot when WWII came along. Kjell started in the car business with a Jeep dealership in 1946. Later that year, he took a ride in an MG. After a ten-minute spin, he was enthralled. After selling the Jeep dealership, he formed British Motor Car Distributors, LTD in San Francisco and became the Northern California MG distributor. After adding Morris, Riley and Jaguar cars during the fifties, The Qvale Automotive Group became dominant in the Northern California car business. Great nostalgic article – thanks for keeping the memories alive! I wonder what some of these folks think of the 2013 version of “sports car racing” since it is all so serious now? @Chuck, my dad raced at those races and while todays racing is very serious and money driven, he absolutely loves it and doesn’t miss a race in TV. He doesn’t compare the two though, apples to oranges as far as the the big picture. But out on the track, it’s apples to apples for the driving, which he loves. He also has movies from those “good ole days” that are a true treasure. Thanks, Scott, that’s good to hear your dad enjoys today’s action – it stays in your blood I guess. Today’s “track days” or “DEs” are very close in spirit to the 50s races in that many of us still drive our cars to and hopefully from the track and enjoy the camaraderie and friendships as much as the driving challenges. Then it was the Jag 120 and now it is the Vipers or ZR1s that blow your doors off, but we love being there! Hi Scott, please contact me, I’m producing a documentary on the races. Great story Art. You probably know this, but If anyone follows your directions for a drive around the old track, they’ll be doing a slightly abbreviated version. Though much of the original road racing course is remarkably intact, there have been changes to a few of the roads, and to the names of some roads, around the upper parts of the old course. The 1950 race would have gone straight ahead on Drake Road at present-day Stevenson Road, then made the sweeping right onto what is now Forest Lake Road, before coming down the hill to the hairpin right, back onto Portola. Unfortunately, you can’t drive this stretch between Stevenson and Forest Lake anymore. Also, I’m not sure what award Mr. Qvale is presenting in the photo, but it’s certainly not the main event trophy in 1950. The 1950 Pebble Beach trophy was something like 3 feet tall, and was presented to Phil Hill by Mrs. Bjarne Qvale while he sat in the black XK120 just after the race. Terrific story Art! Thanks. Off to buy a book or 2. Nice article Art, thanks for the memories. A friend recently passed away leaving the Bill Kerrigan MGTC from the 1950 race and several extremely low mileage MGs. Any reference material you can recommend would be appreciated by the family and myself.